Akron, Ohio (March 6, 2019) – Filtrexx International, a leading developer of Sustainable Management Practice (SMP) solutions, announced this week the statistics on how their SMP solutions impacted the environment in 2018. This included SiltSoxx™, EnviroSoxx®, GroSoxx®, compost blankets and Filtrexx Mesh applications. 353,267 cars removed from highways/roadways (equivalence to CO2 prevented). All of these numbers increased from the 2017 environmental statistics report. Filtrexx saw an increase of 2.7% in organic waste recycled, sediment prevented from going into waterways, CO2 entering the atmosphere and cars removed from highways. While the increases may have been small, seeing an increase overall is extremely positive for Filtrexx’s impact on the environment. November 29, 2017–Filtrexx® LivingWalls™, leading manufacturer of vertical living walls and retaining living walls for industrial, commercial and consumer applications, hosted an Open House earlier this month at their St. Louis, Missouri facility. The event featured facility tours, product displays, and product demonstrations. Attendees who included St. Louis area restaurant and nursery owners, architects and engineers were treated to a facility tour, refreshments, a raffle and great question and answer sessions with the entire LivingWalls team. The Filtrexx LivingWalls team hopes this event is just the beginning to introducing their business to the community and surrounding region of St. Louis, Missouri. Their plans include hosting future targeted Open Houses geared toward specific industries. Living walls, also commonly known as green walls or vertical walls, are vertical spaces covered by live vegetation. Filtrexx LivingWalls has an extensive portfolio of living wall solutions. Their vertical living walls offer higher aesthetic appeal for commercial and interior applications, while their retaining living walls provide habitat restoration and aesthetic revitalization. For more information on Filtrexx LivingWalls or to place an order, please contact us with the form below. July 1st, 2017– EcoPractices, a sustainability verification company has teamed with Filtrexx International, a leading developer of Sustainable Best Management Practice (SBMP) solutions, and the inventor of compost-based Soxx™ technology to advance corporate sustainability programs through measurable metrics and third-party verification. EcoPractices is a Sustainability Platform that identifies, collects, verifies, documents, and generates positive environmental impacts produced from SBMPs. Many companies have sustainability goals they strive to reach every day. EcoPractices is a unique platform for these companies to provide the third party proof their practices were implemented and the scientific environmental benefit values that can then be showcased with an EcoPractices Marketing Tool Kit. Filtrexx teaming up with EcoPractices provides a collaborative effort to achieving sustainability with an exclusive product partner relationship. View the EcoPractices Industry Overview Video to learn more about how EcoPractices Sustainability Platform Process works with Filtrexx SBMP solutions. EcoPractices, is a brand of Sustainability Partners (SP), was established after seeing the need to help companies create and reach sustainability goals with a variety of services and product solutions. Sustainable Environmental Consultants is a majority owner of SP and is a subsidiary of Wright Service Corp, an employee owned company that has been in the environmental business since 1933. Strategic Risk Solutions is also an owner of SP. If you would like more information about this topic, please contact Jennifer Jensen at 515-446-8723 or email at Info@EcoPractices.com. New York, New York, December 14, 2016 – Leucadia National Corporation (NYSE: LUK) (“Leucadia”) today announced that it has entered into a definitive purchase agreement to sell 100% of Leucadia’s wholly owned subsidiary, Conwed Plastics (“Conwed”), to Schweitzer-Mauduit International, Inc., (NYSE:SWM) (“SWM”). Under the terms of the transaction, which is expected to close in January 2017, Leucadia will receive $295 million in cash at closing plus potential earn-out payments over five years of up to $40 million in cash to the extent the results of Conwed’s subsidiary, Filtrexx International, exceed certain performance thresholds. As of September 30, 2016, Leucadia’s net investment in Conwed was $104 million, of which $46 million was tangible book value. Leucadia estimates it will recognize a pretax gain of approximately $175-185 million (excluding value associated with the earn-out) upon the closing of this sale. Headquartered in Minnesota, Conwed is the leading light-weight plastic netting manufacturer in the world with more than forty-five years of experience developing netting solutions to help its customers improve their products in a wide range of industries. From agriculture, automotive, building and construction and consumer products to filtration, hygiene, medical and packaging applications, Conwed’s netting portfolio provides essential performance functionalities. Leucadia National Corporation is a diversified holding company that invests in a broad array of businesses. The Company’s financial services businesses and investments include investment banking and capital markets (Jefferies), asset management (Leucadia Asset Management), foreign exchange trading services (FXCM), real estate (HomeFed), commercial mortgage banking and servicing (Berkadia), and vehicle finance (Foursight and Chrome). The Company’s merchant banking businesses and investments include beef processing (National Beef), a diversified holding company (HRG), oil and gas exploration and production (Vitesse Energy and Juneau Energy), automobile dealerships (Garcadia), manufacturing (Idaho Timber), telecommunication services in Italy (Linkem), and a gold and silver mine (Golden Queen). This press release may contain “forward-looking statements” within the meaning of the Private Securities Litigation Reform Act of 1995 and other federal securities laws that are subject to the safe harbor created by such laws and other legal protections. Caution should be taken not to place undue reliance on any such forward-looking statements because actual results may differ materially from the results suggested by these statements. These forward-looking statements are made only as of the date of this presentation. We undertake no obligation to publicly update or revise any forward-looking statements, whether as a result of new information, future events or otherwise. In addition, forward-looking statements are subject to certain risks and uncertainties that could cause actual results to differ materially from our historical experience and present expectations or projections. These risks and uncertainties include, but are not limited to, those described in Part I, “Item 1A. Risk Factors” and elsewhere in our Annual Report on Form 10-K for the period ended December 31, 2015 and those described from time to time in our periodic and other reports filed with the Securities and Exchange Commission. Tangible book value is a non-GAAP financial measure used by Leucadia when reviewing each of our businesses and investments and may not be comparable to non-GAAP measures used by other companies. We believe that this information is useful to investors as it allows them to view our businesses and investments through the eyes of management while facilitating a comparison across historical periods. We define tangible book value as shareholders’ equity less intangible assets, net and goodwill. Our net investment (shareholders’ equity) in Conwed at September 30, 2016 was $104 million, intangible assets, net and goodwill totaled $58 million and tangible book value was $46 million. ST. LOUIS, MO (May 24, 2016) – Filtrexx® LivingWalls™, leading manufacturer of living walls, retaining living walls and green roofs for industrial, commercial and consumer applications, will speak at Grey to Green Conference 2016 in Toronto, Canada (June 1-4, 2016). The presentation titled “Living Alternatives to Concrete Retaining Walls” will be given by Mark Woolbright, LivingWalls Division Manager at Filtrexx. Organized by Green Roofs for Healthy Cities and the Green Infrastructure Foundation, the Grey to Green Conference 2016 is about sharing the value of green infrastructure (bioswales, green roofs, living walls, etc.) as an important tool in the fight to mitigate against and adapt to climate change. Doubled in size from prior years, Grey to Green Conference 2016 includes a two full-day program with 52 presentations and panel discussions from over 60 industry experts. This conference is the leading forum for designers, policy makers, manufacturers, growers, landscapers, and green building professionals to discuss the benefits of the green infrastructure industry, and how to grow it even further. “Our LivingWalls division is committed to developing sustainable alternatives for green infrastructure projects. We take pride in collaborating closely with our customers to identify the most suitable living wall, retaining living wall or green roof solution for their project”, said Mark Woolbright, LivingWalls Division Manager at Filtrexx. Filtrexx LivingWalls has an extensive portfolio of living wall solutions. Their living walls offer higher aesthetic appeal for commercial and interior applications, while their retaining living walls provide the underlying structure needed to permanently stabilize extreme grade changes in industrial and building applications. “We build a wide range of Mechanically Stabilized Earth (MSE) and non-MSE solutions for walls and slopes from 45 to 80 degrees of inclination, with varying degrees of design flexibility and planting options. We are truly a one-stop shop for living walls, stabilization and stormwater management solutions because we also incorporate other systems from our Filtrexx Soxx technology portfolio”, said Woolbright. “We are looking forward to connecting with the green infrastructure community at the Grey to Green Conference and believe it is the right place to share our latest living wall solutions”. Filtrexx LivingWalls is the leading manufacturer of living walls, retaining living walls and green roofs for industrial, commercial and consumer applications. Based in St. Louis, MO, it is the LivingWalls Division of Filtrexx, the inventor of the compost filter sock. Filtrexx® Soxx™ technology has expanded into stormwater management, sediment & erosion control, pollutant removal, living walls, agriculture and gardening applications. Headquartered in Akron, OH, Filtrexx has an extensive network of partners and distributors to serve customers across the globe. AKRON, OH (May 11, 2016) - Filtrexx, the inventor of Soxx™ technology and leading developer of sustainable solutions for stormwater management, sediment & erosion control, pollutant removal, living walls, agriculture and gardening applications, announced the official launch of its new, revitalized website www.filtrexx.com . This new Filtrexx website provides a consolidated overview of the company, its applications, products, capabilities and expertise incorporating the latest technology in content management systems and an optimized web experience with responsive design suitable for mobile devices. 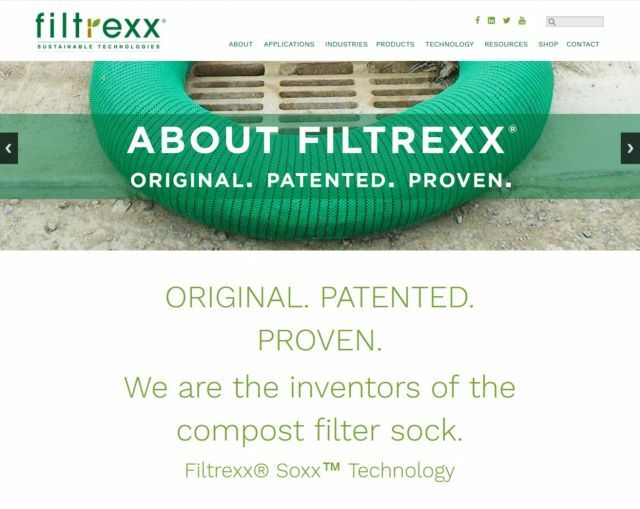 Filtrexx is the inventor of the compost filter sock. Since its invention in 2001, Filtrexx® Soxx™ technology has expanded into stormwater management, sediment & erosion control, pollutant removal, living walls, agriculture and gardening applications. Filtrexx Soxx are three dimensional tubular mesh devices filled with different types of Filtrexx Media that are typically used to stop, divert, absorb, clean and filter stormwater runoff in construction and post-construction activities. Used alone or in combination with other low impact development solutions, Filtrexx Soxx offer a reliable, sustainable solution for most challenging project developments. “Despite the numerous applications in diverse industries, our Filtrexx Soxx technology can be easily understood by the addition of these three elements: Mesh, Media and Sorbents or Vegetation. We are the partner of choice for engineering and construction firms looking for sustainable, low impact development solutions”, said Rob Carrothers, chief executive officer at Filtrexx. Filtrexx® SiltSoxx™, the first compost filter sock Filtrexx invented, has become the superior alternative to silt fence and straw wattles in challenging sediment control applications. Check dam, concrete washout, inlet protection, perimeter control, runoff diversion, sediment traps and slope interruption are some of the best management practices (BMPs) Filtrexx offers to trap and control sediment in construction sites. “In recent years, Filtrexx has grown organically and through acquisitions; this new website will help us re-introduce ourselves with our full set of products and capabilities to all engineering and construction firms across industries”, said Carrothers. From oil & natural gas, highway and road construction, land and building development — commercial & residential — , government, municipal and utilities projects to landfill construction & maintenance, manufacturing — pollution control—, metals manufacturers, scrap yards and environmental remediation applications, Filtrexx offers an extensive portfolio of Soxx solutions. “We collaborate closely with our customers to identify the most suitable Soxx technology for each specific application and we believe our new website highlights how we provide design and engineering advice to guarantee our customers’ projects success in a wide range of industries”, said Carrothers.